Worldmark Resort St. George offers nice lodging with a variety of floor plans, ranging from one bedroom units up to 3 bedroom accommodations. The 1BR villa sleeps 4 people in a king bed and queen Murphy bed. The 2BR has a king and a queen or a king and 2 twins, and a Murphy bed. The 3BR has a king, a queen, and 2 twins, along with the Murphy bed. All condo vacation rentals provide a full kitchen, and washer and dryer. The 1BR has one bathroom and the 2BR and 3BR have 2 baths. We have arranged for free wireless internet access, in-room, using our owner’s account (a $20 value). 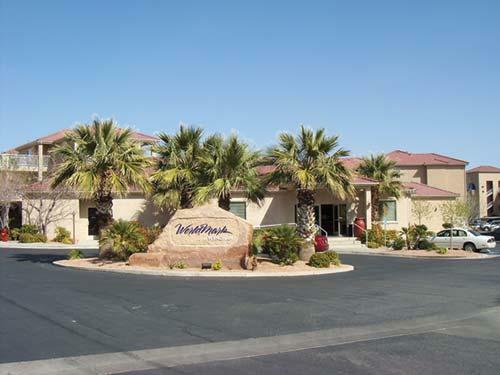 Please click here to see current availability, prices, payment options, photos and other information regarding Worldmark Resort St George condo vacation rentals. Reserve now for the Huntsman World Senior Olympic Games or the Ford Ironman. Book early, these luxury condos sell out well before the events.